Dilution of precision (DOP) is the multiplier of observation (measurement) error into parameter error in a least-squares adjustment. For example, in hydrography and GPS, HDOP is the multiplier of 1D range error into 2D horizontal position error. DOP is a consequence of the geometry (angle of cut) of the adjustment. A good DOP is a low DOP, i.e. a low multiplier of observational error into parametric (coordinate) error. Solving for the 7 parameters of a Helmert (Bursa-Wolf or similarity) datum transformation is a least-squares adjustment affected by geometry, specifically the areal distribution of the survey points in the two datums. All other things being equal, a large areal distribution (good angle of cut) produces a low P7DOP (see formula). 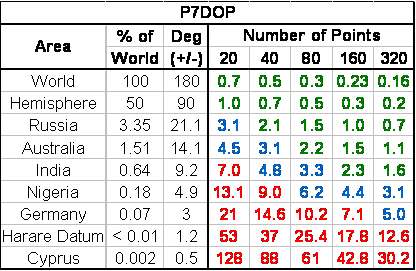 Small areas produce high P7DOP and are not suitable for 7-parameter adjustments due to the high correlations among the parameters. Use a 3-p or 10-p (Molodensky-Badekas) datum shift instead. The chart below relates area and number of survey points to P7DOP. Avoid the red P7DOPs. Download the entire presentation "Molodensky-Badekas: Reducing the Consequences of Parametric Correlation in the 7-Parameter Shift", which describes why the derivation of a 7-parameter datum shift for a small area of the Earth results in high correlations among the parameters, whose values are consequently determined by observational "noise".